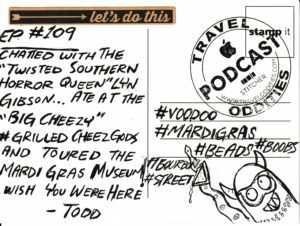 On this week’s episode, Harley and Brett are gearing up for Mardi Gras in the most unique city in America, New Orleans, Louisiana. Harley is a year older and apparently the light is fading fast…you know, because he is 44. We have a great interview with Lyn Gibson, aka The Twisted Southern Horror Queen about Madame Lalaurie and the Lalaurie Mansion. Madame Lalaurie might have been the sickest person alive at the time. New Orleans is one of the world’s most fascinating cities – it’s home to a truly unique melting pot of cultures, and we explore some of the more unusual aspects. We found a way to get a real behind-the-scenes look at New Orleans Mardi Gras at Mardi Gras World. Harley and Brett never stop scouring a town until we find something awesome to eat…and we found the fat dude at BigCheezy at Henry’s uptown Bar. This place takes the grilled cheese to a whole new level. 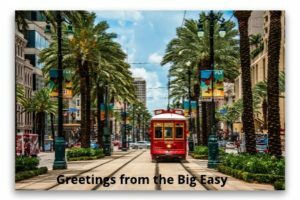 The Travel Oddities Top Five is full of music and good times, just like New Orleans, LA.